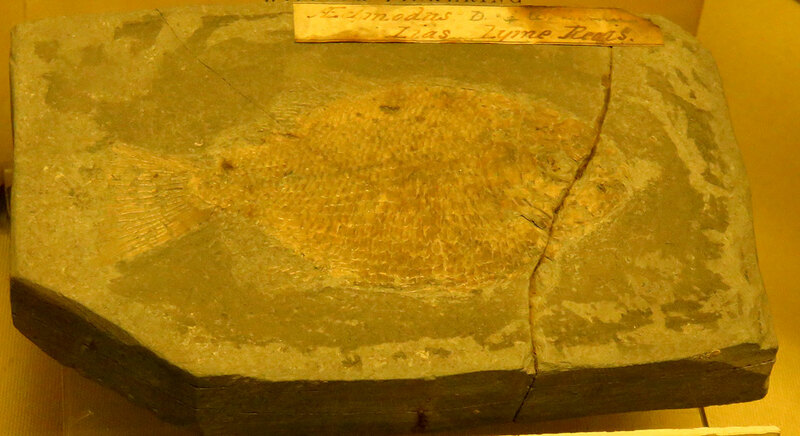 This image is of the Dapedium politum fish fossil. It was found in the lower Liassic of Lyme Regis England. Creature is from the Lower Jurassic Period. Fossil on display at the Lyme Regis Museum in England as of August 2016. This specimen was probably collected by Mary Anning. It was described in the Transactions of the Geological Society of 1821, in "Remarks on the Geology of South Coast of England, from Birdport Harbour, Dorset, to Babbacombe Bay, Devon." by H.T. De La Beche [read March 5, 1819].